Checky answers a simple question: how many times a day do I check my phone? 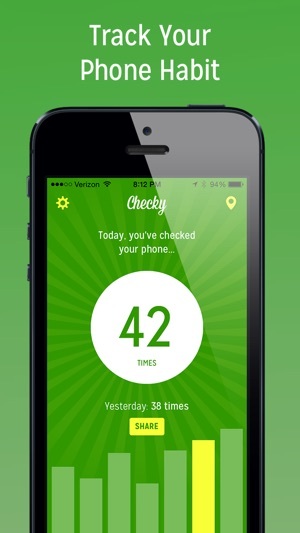 By giving you insight into your phone checking habit, Checky helps you become more aware. This awareness can help you make changes to your phone usage, if you feel you need to make a change! It's also fun to find out exactly how much you are using your phone, and to compare your stats with friends. If you like the app, please take the time to rate it! It's pretty painless, and it'll keep our boss from making us add those annoying "please rate us" popups. 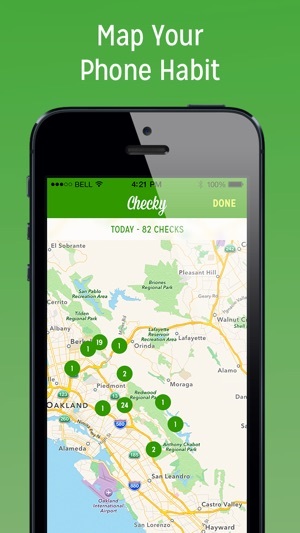 Please be aware that Checky requires continued location tracking. Continued use of GPS running in the background can dramatically decrease battery life. I never write reviews but I will chime in on Checky I’ve found after a week I’m reducing mindless checking of phone and saving quite a bit of battery life during the day as a good side effect. This app works quite well, much better than other ‘trackers’ I’ve seen which require explicit start/stop/pause. This app works quite well in the background . I’d like to see them add more options and (such as, if you check to get a phone call, you could exclude that one in the count) and keeping track of stats longer than a week. Overall great, I’ll keep using it for sure. If you just want to know how many times you check your phone each day, this app does a good job. Showing you exactly how many times are you swiped your phone open to check messages, respond to notifications. However, you need to enable your location service all the time. Even if this app is just running in the background, it’s tracks your location all the time. Once you disable the locator service the app stopped working. This is very annoying and unnecessary which is why I decided to uninstall the app. 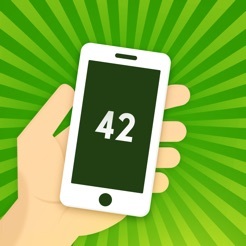 Verdict: if you want an app just tell you how many times you check your phone, do not mind the location service being on 24/7, . Then this app is for you. I don’t write reviews but this app is really frustrating. I have an iPhone 7 Plus. This app is difficult to use, doesn’t count unless location services are fully on for it, which results in the app needing to be open at all times to track. This then results in having a blue nav banner at the top of your screen that doesn’t go away without closing the app completely, and that burns your battery like crazy when it’s on. Finally, it didn’t event count accurately. Would not recommend. Needs a lot of R&D. Requires iOS 7.0 or later. Compatible with iPhone, iPad 2 Wi-Fi + 3G, iPad Wi‑Fi + Cellular (3rd generation), iPad Wi-Fi + Cellular (4th generation), iPad mini Wi-Fi + Cellular, iPad Air Wi-Fi + Cellular, iPad mini 2 Wi-Fi + Cellular, iPad Air 2 Wi-Fi + Cellular, iPad mini 3 Wi-Fi + Cellular, iPad mini 4 Wi-Fi + Cellular, 12.9-inch iPad Pro Wi-Fi + Cellular, 9.7-inch iPad Pro Wi-Fi + Cellular, iPad Wi-Fi + Cellular (5th generation), 12.9-inch iPad Pro Wi‑Fi + Cellular (2nd generation), 10.5-inch iPad Pro Wi‑Fi + Cellular, iPad Wi-Fi + Cellular (6th generation), iPad Pro (11-inch) Wi-Fi + Cellular, iPad Pro (12.9-inch) (3rd generation) Wi-Fi + Cellular, iPad mini (5th generation) Wi-Fi + Cellular, and iPad Air (3rd generation) Wi-Fi + Cellular.